Long-lasting. 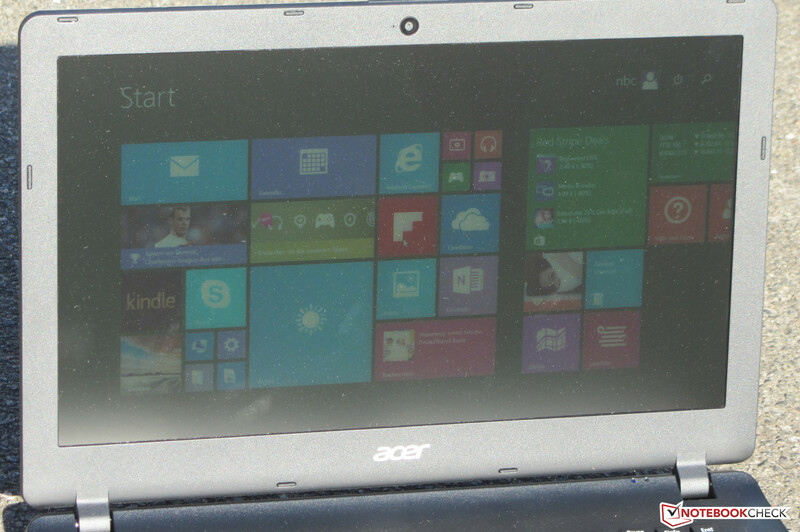 The Aspire is a compact, 13.3-inch subnotebook. The laptop's distinguishing features are its low price of approximately 350 Euros (~$388) and its long battery life. However, the laptop's fan can get annoying. Acer's 13.3-inch Aspire ES1-311 is aimed at all users who are looking for a portable laptop and do not want to spend too much money on it. The laptop's price is just below 350 Euros (~$388). The buyer gets a Pentium processor and a 1 TB hard drive among other things for that. Our report reveals whether the laptop is convincing. 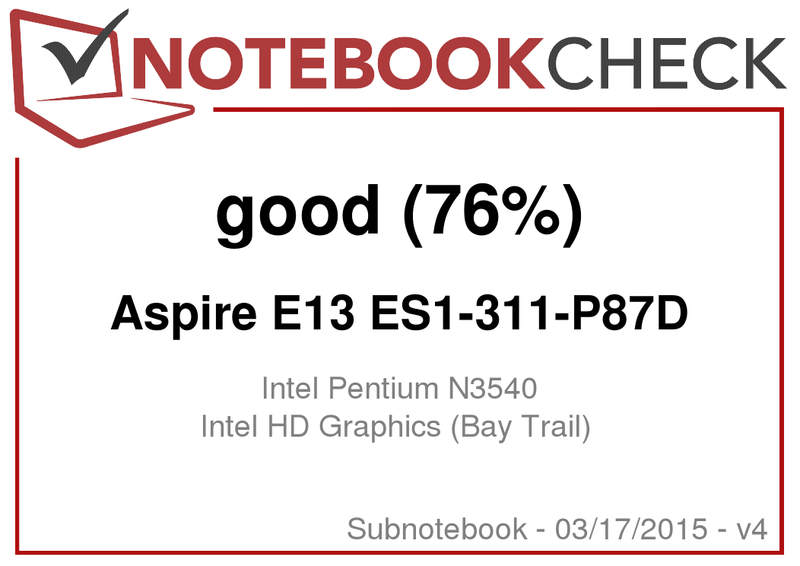 The Aspire barely has any rivals in the category of very affordable 13.3 and 14-inch laptops. HP's Stream 13 can be named in the 13.3-inch sector. Acer's Aspire V3-371 is also a contender, but even the lowest-priced model of the range is still 50 Euros (~$55) more expensive than the ES1-311. 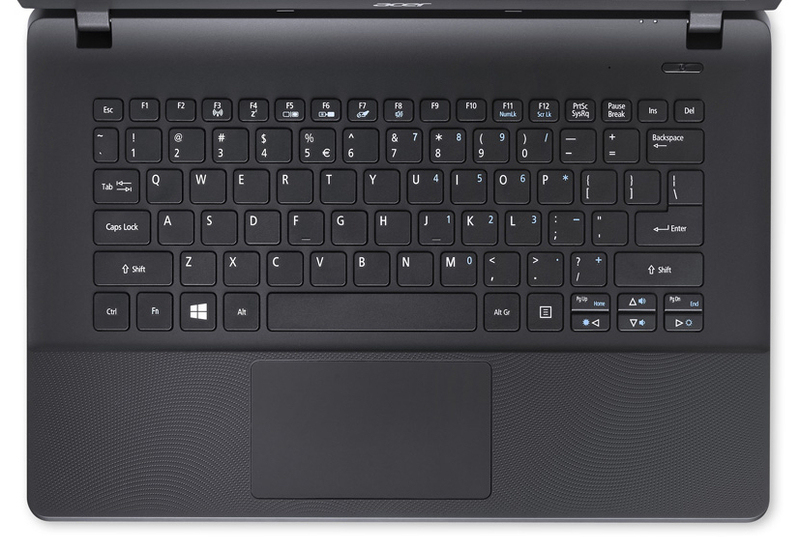 Competition in the 14-inch division is found in, for example, HP's Stream 14-z050ng and HP's 14-r003ng. 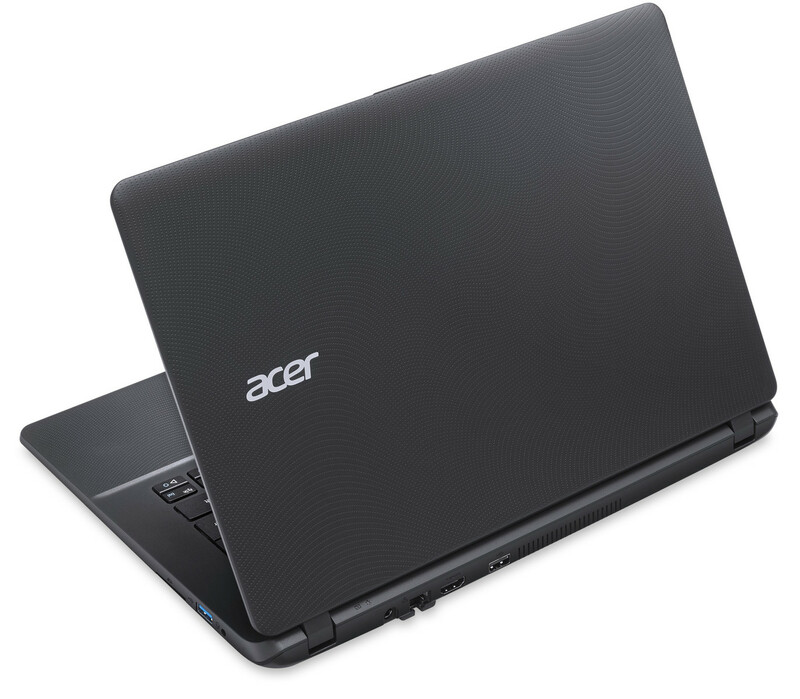 The Aspire has the fundamental casing form and looks with the Aspire ES1-511 (15.6-inches) and Aspire E1-111 (11.6-inches) models in common. 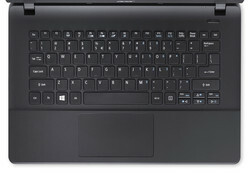 The laptop is comprised of matte black plastic, and both the wrist rest and display's back are structured. 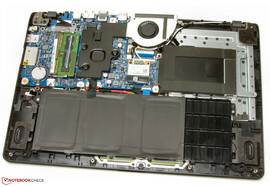 The laptop does not have a maintenance cover, but the base unit is relatively easy to take away. The battery cannot be removed. The laptop's stiffness is basically satisfactory. It has the weak points that we also find in more expensive laptops. The casing can be dented below the touchpad, and the lid could be stiffer - it warps quite easily. Furthermore, images distort on the screen when pressure is applied to the lid's back. The base unit's underside can be removed. The interfaces are distributed on the casing's rear and right. The Aspire does not have any surprises. However, a third USB port would be appreciated. The 64-bit version of Windows 8.1 with Bing is the operating system used. The laptop is not shipped with a recovery DVD. Buyers of the Aspire also get a one-year license for McAfee LiveSafe Internet security alongside the programs PhotoDirector and PowerDirector from Cyberlink. Acer installs an unlit chiclet keyboard in the Aspire. The level, lightly roughened keys have a short drop and clear pressure point. However, their resistance could be crisper for our taste. In total, Acer provides a decent keyboard. The multi-touch capable ClickPad has a surface area of 10.5 x 6 cm and thus has plenty of room for gesture control. The fingers easily glide over the pad's sleek surface. The pad has a short drop and clear pressure point. 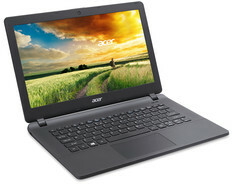 Acer uses a matte 13.3-inch screen with a native resolution of 1366x768 pixels in the Aspire. It has a brightness of 254.4 cd/m², which is acceptable considering the laptop's price level. That does not apply to the contrast of 163:1 and black level of 1.71 cd/m². These rates are not exactly awe-inspiring even for the low-cost sector. The color reproduction in state of delivery is not compelling. The screen has a DeltaE 2000 shift of 10.73. That is a normal rate for a laptop from the low-cost sector. The target would be a rate less than 3. Beyond that, the screen has a bluish cast. Acer equips the Aspire with a TN screen, and consequently the screen only has limited viewing angles. Using the Aspire outdoors is possible, but direct sunlight should be avoided. Acer has a basic, 13.3-inch office laptop in its lineup with the Aspire ES1-311. It has enough computing power for applications from the office and Internet fields. The long battery life makes it interesting for mobile use. Our review sample is sold for around 350 Euros (~$388). Acer has other configurations in its lineup. The Aspire is powered by a Pentium N3540 (Bay Trail) quad-core processor. The CPU clocks with a base speed of 2.16 GHz, which can be boosted to 2.66 GHz via Turbo. The Turbo is utilized in both AC and battery modes. 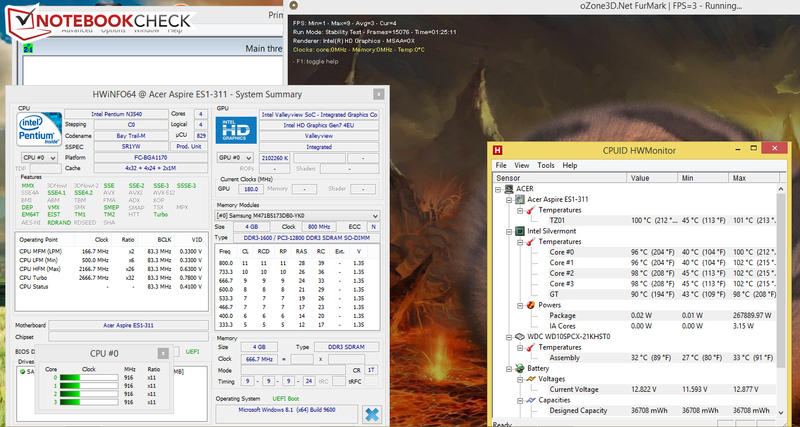 The CPU tests of the Cinebench benchmarks were always processed with 2.66 GHz. 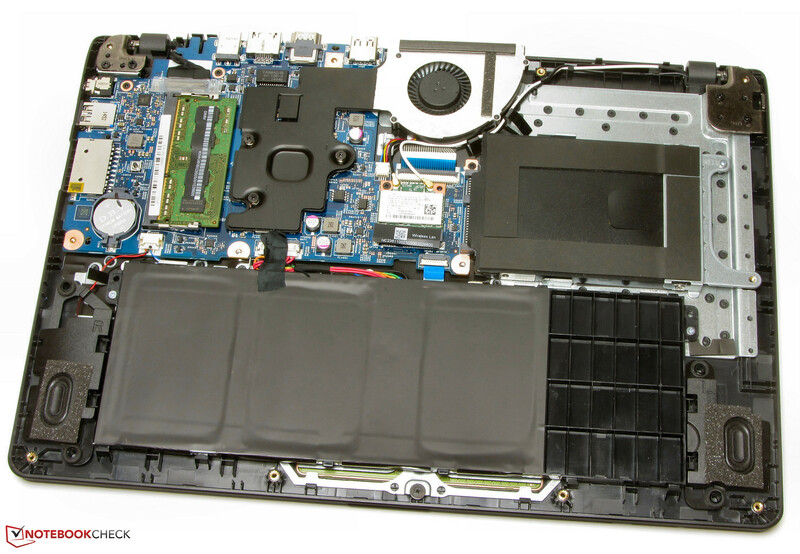 The laptop ran smoothly and we did not encounter any problems. The PCMark benchmark scores match the performance of the installed hardware. Replacing the hard drive with a solid state drive could improve the system's performance. The Aspire sports a hard drive from Western Digital. It has a capacity of 1 TB and spins with 5400 revolutions per minute. The laptop's owner will thus not be requiring more storage very soon. The hard drive's transfer rates are on a normal level for a 5400 rpm model. Intel's HD Graphics core is responsible for video output. It supports DirectX 11 and clocks with a speed of up to 896 MHz. The 3DMark benchmark results are on par with those of identically configured laptops. Comparable graphics cores from AMD can boast with considerably more power. Neither the CPU nor the GPU in the Aspire have been made for up-to-date 3D games. Only some games can be rendered smoothly. This is different with the games that Microsoft has in its Windows Store. They usually run smoothly. Really gaming-suitable, 13.3 to 14-inch laptops with a dedicated graphics core are scarce in the low-cost sector (below 500 Euros, ~$555). The models from the Aspire V3-371 lineup are slightly more gaming suitable than the Aspire ES1-311. They feature stronger integrated graphics cores from Intel. The laptops of this range are available for prices starting at 400 Euros (~$444). The Aspire's fan is usually inactive in idle mode. Solely the hard drive's noise is heard most of the time. The fan increases its speed slightly during load. We measured a noise level of up to 35.6 dB. However, the fan produces side noises in the form of whistling. Note: The fan of our review sample ran permanently in state of delivery, i.e. the very aggravating whistling noise was always audible. Since the low-performance Bay Trail processors normally do not need to be cooled consistently, we presumed that there was an error in the system. We reloaded Windows 8.1 and replaced the installed hard drive with an SSD to check this. We were no longer annoyed by a permanently running fan in both cases. The Aspire performed the stress test (Prime95 and Furmark run for at least one hour) in the same manner in both AC and battery modes. The CPU and graphics core clocked with their full speed for only about 10 minutes. After that, they recurrently throttled abruptly. The graphics core's speed dropped to 180 MHz, and the processor throttled to rates from 800 to 1400 MHz. The Aspire's temperature development was mostly moderate, but 50 °C was surpassed on one measuring point on the underside in the fan's area. The stereo speakers are located on the laptop's underside. They produce a slightly muffled sound that can, however, be listened to even for a longer time. Using external speakers or headphones is recommended for a better sound experience. The Aspire's energy requirement is on a normal level for the installed hardware over the entire load range. A maximum of 20.4 watts was reached in the stress test. This rate dropped in the course of the test because both the CPU and GPU were recurrently throttled. Websites are opened automatically every 40 seconds in the real-life Wi-Fi test using the "Balanced" profile and a screen brightness of approximately 150 cd/m². The Aspire manages a runtime of 6:55 hours - a very good rate. Acer demands around 350 Euros (~$388) for its Aspire E13 ES1-311-P87D. The buyer gets a basic, 13.3-inch laptop with enough computing power for applications from the office and Internet fields. Decent input devices and a long battery life are also a part of the bundle. The laptop even has plenty of storage. The screen will not win any awards, but it is mostly acceptable considering the price level. The contrast should be higher, though. 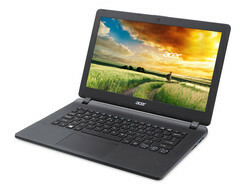 Acer has an affordable and long-lasting typing and browsing machine in its lineup with the Aspire ES1-311. Acer will have to repair the fan. Although it usually only spins for a short time, its whistling is extremely annoying.